Promoting your business online and in person can be a big challenge. This is why amping up your sources and channels for word of mouth to occur is crucial. If you’re searching for a way to amp up the volume, a brand ambassador program may be exactly what you need. Starting a brand ambassador program can definitely help you promote your business by using word of mouth tactics. Thanks to social media, you may be able to find a few ambassadors eager to help by simply looking online. In fact, there are a ton of opportunities out there for you to get the word out about your business. The best part is, it can be done without you having to mass-blast your information… Instead, you can have an ambassador in your program do it for you. A brand ambassador is a person who uses and/or has tried your product and absolutely loves it. In fact, they like it so much that they promote it on your behalf without payment or having been asked. Most brand ambassadors also happen to be experts in the field, so their free endorsement typically appeals to the crowds. A great brand ambassador can really make their word stick providing you with a good source of credibility. Take a dentist, for example, who recommends a specific brand of toothpaste to her patients. She most likely will pitch only the brands she trusts and uses herself. Therefore providing you with a persuasive advertisement, that is powerful and believable. Some people use advocate and ambassador interchangeably. But, it should be noted that a true brand advocate is a consumer, and a brand ambassador is typically someone that is sought out to help. What Makes A Brand Ambassador Program Awesome? There are a variety of reasons a brand ambassador is important. They can help you accomplish quite a bit, in the realm of getting your brand and product out there. Plus, they happen to love your product just as much as you do, so their sharing is typically done out of love and is easily received by future customers. Watch the content keep rolling in, and with each ambassador comes a new twist to promote you. It’s like having an army of marketers shine a spotlight on your best angle. All this content is great for bringing in more traffic and helping you mark your spot in the market. One of the best parts about having a brand ambassador program is that brand ambassadors will create content for you. If you are on a social platform, you have probably seen content created by an ambassador. It’s typical for a brand ambassador to rave about a product online, and even include an image of the product in their post. Best of all, this content is free and made purely because the customer loves what you do. Most of these posts are unsponsored and unpaid, unlike endorsed influencer created content. But, what’s magical is that you’ll get a ton of spot-on content created for you, at the fraction of the time it would take your team to do it. Look it’s hard to get yourself out there, and it’s even more difficult to be everywhere. That’s where ambassadors come in. What do ambassadors do with their created content? They share it. Meaning you now have free advertisements for your business swept all over the place. It’s like having an army of super fans helping you to get your brand message across. Most of the time they share via social media, but they can share everywhere. You get the point. Most brand ambassadors are willing to commit a little time to support your brand. Get this, your ambassadors have an easier time connecting with your audience than you do. This is because they are typically experts in the field. Oh, and not to mention they are speaking directly to their friends, family, and those who already follow them. Plus, their enthusiasm for the product comes off as genuine, and that is the real reason they have an easier time resonating with potential customers. Your product will evolve as your brand grows. By working closely with your brand ambassadors you will learn what changes can be made and what you need to do to get a leg up. Ambassadors are important for growth because they help you see your product from outside the box. While you’re hard at work, creating and pushing forward, your ambassadors are seeing things that you might be missing. You’ll want to hear feedback from them, so make sure you leave the door open for feedback. You might not always think their ideas are gold, but their feedback and ideas are what will help you create a better product in the long run. Plus, they make great testers, thus helping you smooth out kinks before launching or releasing to the public. You’ve sorted out a few people that you think will be a great brand ambassador. Now you’re stuck wondering how to actually run an ambassador program. No, you don’t have to run a super complicated program. If you really wanted, you could just ask some customers to help you out. However, if you want a well-oiled program, you might want to consider a few things. Using a software can be a life-saver because it can do all the hard work for you. You won’t have to spend hours tracking performance on your own. You won’t have to worry about reaching out to remind ambassadors to do their job. And, it doesn’t even have to be that expensive (especially if you consider the money you’ll make from your ambassador’s leads. Brand24 is great and affordable software that can help you track who is talking about you online. It can also help you pinpoint your potential ambassadors so that all you have to do is reach out to them. SocialToaster is a software that can help you run your ambassador program. It helps you find social media users who talk about you. It helps you turn them into superfans who then share your content with their social networks. Those are just a few of the many options out there. There are others that can help you run full-circle programs that allow you to reward ambassadors, and do so much more with your program, like Heartbeat and Experticity, which allows you to control all aspects of your ambassador program. Another way you can find the best ambassadors for your brand is to weed out those who are unfit. You can do this by creating an application process. Once you reach out to potential ambassadors, have them take an assessment. This is your chance to ask them straight up if they are willing to share you with their friends. This way you can take out the ones who are not willing, and keep the ones who are. Plus, you may be able to dwindle it down even more to those who are willing to talk about you, time and time again. Whether you are running a program based on a spoken contract, spreadsheets, or through software, you need to have clearly defined goals and objectives. Do you want ambassadors to share a certain amount of times? Does it matter what platform they share on? Another thing you need to have worked out is whether or not you are going to compensate your ambassadors. Some programs pay the ambassadors with products, some pay with money, and some don’t pay at all. Whatever you choose, you need to define these terms with your ambassadors. Let them know how they will be compensated and what they will be compensated for. Having a good rapport with ambassadors can keep them active. If you start to get skittish or put off bad vibes, it can hinder how your brand ambassador feels about your program. So, make sure you are easy to communicate with. Be there for them, answer questions, and encourage them along. You can even send feedback to them every once in awhile, to show that you are recognizing their hard work and effort. All of which can help launch our brand ambassador program to the next level. Building trust can help build your reputation too! Now that you have your head in the game. Let’s review a few brand ambassador programs. Who knows, maybe you’ll see a few ideas that you’d like to try in your own program. The athletic clothing company wanted to foster authentic relationships. It’s said that Lululemon’s ambassador program encourages autonomy and personal growth in both employees and consumers. They wanted to use local ambassadors, influencers, alongside elite athletes, and fitness gurus. The goal of the program is to provide feedback on the product and help out with social impact programs. Thus leading to an increase in brand loyalty. Lululemon ambassadors can fit into one of the three categories, 1. Elite Ambassadors, 2. Global Yoga Ambassadors, or 3. Store Ambassadors. The ambassadors are chosen because they are able to reflect on the Lululemon culture. The bright and flashy headphone brand started an ambassador program to help generate more reviews. They wanted to make sure consumers were able to find reliable information to aid in their purchasing decision. Therefore they found some ambassadors to put to the test. The gear testers (aka SkullCandy Ambassadors) were recruited to provide product reviews on the SkullCandy website only after putting the product to the test. The testers were encouraged to use the products as advertised and provide honest feedback. The feedback given came back and was able to reinforce the product line and provide useful information to future customers. SkullCandy now uses this user-generated content and feedback to help future customers identify which of their products will work best for them. 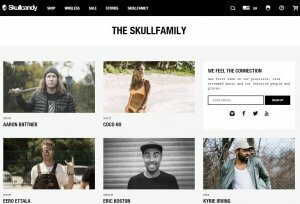 SkullCandy also has a list of members who are considered “SkullFamily”. The SkullFamily is made up of athletes who show off the SkullCandy products in their everyday lives. Thus, influencing their fans around them. Now that you understand the foundation of a brand ambassador program, you may want to start figuring out who would make a good ambassador. The trick is to find someone that you can trust, and others can trust too. You also want to make sure you pick someone who truly loves your brand. So much so, that they will be fine talking about you repeatedly, and over an extended time. Keep an eye on these types of people as they are perfect for a brand ambassador program. If you have some great customers and notice a few that are beyond thrilled for you, use them. They make great brand ambassadors. They are happy, they like you, and they seem enthusiastic. If you are new to the scene, you may not have a wide range of customers yet. No worries. Get people interested in offering them to try your product for free and then provide you some feedback. Once you let them test out the waters, you can gauge whether they’d be a good ambassador for you. Perhaps you do some digging and find that you have a few customers who have given you a shout out on social media. Check out these people’s profiles. If they have a large friend base, it’s good news for you. That means they will be able to spread the word about you to a large chunk of people! Scoop these guys up and let them know how much you appreciate their efforts. You can even through in some branded swag to keep them talking about you. Depending on your business, you may look for certain people to represent you, over others. For example, a women’s clothing boutique will probably only want a woman brand ambassador. Regardless of the type of person you are looking for, they should all have one thing in common. They should act professionally. Depending on your type of business, the definition of a professional can vary. But, the point is, you want someone who is going to put your spotlight on you for all the right reasons. You don’t want to work with someone who can be wishy-washy and disrespectful. A brand ambassador program is a cost-effective way to widen your marketing, without having to put much money or effort into it. This is because brand ambassadors can hit different demographics in a variety of regions you may not be able to market to. You provide the product, and your brand ambassadors take care of the rest. If a brand ambassador program isn’t quite what you’re looking for, you may want to consider using an alternative (yet, similar) type of marketing.